​In November of 1934 a fire destroyed a small building used as an office during the rebuilding of the Orr's-Great Island Bridge. Residents formed a bucket brigade and held the flames in check until the Brunswick Fire Department could arrive. Shortly after this incident, Capt. Charles Morrill saw the need for more effective firefighting equipment on Orr's Island. He not only raised funds and helped assemble the first equipment, but he inspired the volunteers (mostly lobstermen and fishermen) to learn basic firefighting methods. 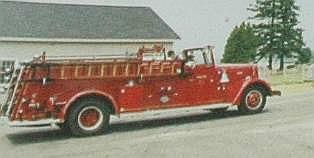 ​The first piece of equipment purchased was a red trailer (towed by the nearest available vehicle) to carry a motor-driven pumper, ladders, hose, tools and a handsome bell. The youngest volunteer was Russell Houghton and it was his proud duty to ride in the trailer and ring the bell en route to the fire. He later went on to serve as chief of the department for 14 years. The department soon discovered it needed a home. The trailer had been housed with public-spirited neighbors but there soon came a day when the trailer was needed and the neighbor was out of town with the trailer tightly locked in his barn. Fortunately the blaze was not serious and bucket brigade was effective. However, a firehouse became a priority. A barn on Little Island Road belonging to Brice Roberts was purchased and remodeled to hold equipment on the lower floor and an area for meetings on the second. The department took three years, from 1934 to 1937, to become well organized. It was incorporated in 1941 with William Sylvester as the first chief. ​Meanwhile, the Bailey Island department was organized in 1937 mainly through the efforts of Phillip Johnson and Dr. Franklin Smith, who became chief and lieutenant respectively. 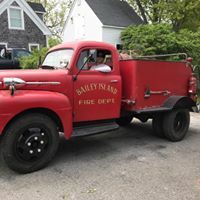 The fire barn was originally located behind the Tracy cottage near the "Sea Banks" on the east side of the island but in 1949 was moved to a location near the Bailey Island Cemetery on land donated by "Muffin" Sinnett. 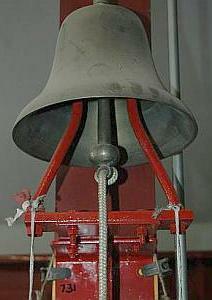 ​Soon after the departments were formed, sirens were purchased and mounted to the top of each of the fire barns. To report a fire all one had to do was dial "0" and inform the telephone switchboard where the blaze was. Descriptions such as "Aunt Jenny's house" or "Driftwood" were all that were needed for the operators (who were all island girls) to direct the trucks to the scene on either island. As the calls were coming in, the operator would hit a switch mounted to the left of her console to sound a siren in a code. One long blast followed by two short ones would indicate the fire was between Redman's Hall and Princes store, while two long and one short blast meant it was between the Post Office and the Swisher house on Orr's Island. ​Both departments met once a week in their respective fire barns, and usually on Sunday morning a volunteer or two would show up at the barn to check the oil and fuel levels and maybe take the trucks for a quick spin around the island to make sure all was in working order. The departments financed their organizations with bake sales and lobster stew suppers which became very popular and well-attended in the area. The Orr's Island department acquired it first vehicle, a three-quarter-ton utility truck, in 1939. The original red trailer was hitched to the utility truck, which carried additional supplies. Once, while on the way to assist with a fire on Bailey Island, Chief John Huff was towing the trailer when it came unhooked, left the road and ended up in a field near the Bailey Island cemetery. The volunteers hauled the wayward trailer back to the road and continued along at a slightly slower pace. ​In 1949 a 750-gallon pump truck and 2,000 feet of hose were added. In 1960, the department purchased a second truck with 1,000-gallon capacity and another 3,000 feet of hose. In 1961, a 1946 ambulance was donated to the department by the Porter-Shaw car dealership in Brunswick and volunteers began to receive basic medical training. During the early 1970s, a 1961 900-gallon tanker was donated by the Brunswick Artesian Well Co. and two 1953 military surplus trucks were donated to the island departments by the Brunswick Naval Air Station. Volunteer converted them into tank trucks, a 1,000-gallon one for Orr's and 1,500 gallons for Bailey Island. In 1968, a three-year old Cadillac ambulance was purchased from the Brackett Funeral Home for $6,500 to replace the 1946 ambulance. Later, in 1976 and 1986, converted vans were used to provide medical treatment and transport. 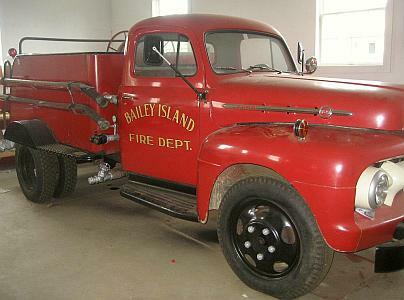 On Bailey Island, The first vehicle purchased for the department was a 1937 International pickup which carried hose and ladders. A 1946 International pumper was acquired by Phil Johnson, and the department later added a 1953 Fort 750-gallon tank truck, along with the military surplus vehicle. The two volunteer departments managed surprisingly well in their early years for their level of training and makeshift equipment. Eventually, however, the communities began to see the need for more modern trucks, more professional training and a building which could house all the equipment under one roof. 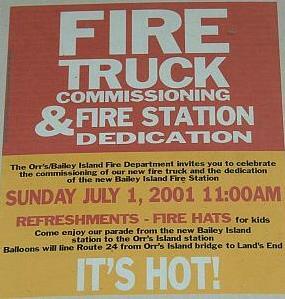 In December of 1986, the two departments consolidated to form the present Orr's and Bailey Islands Fire Department. A new fire station was constructed on land donated by Rachel (Wilson) Leland on Orr's Island. 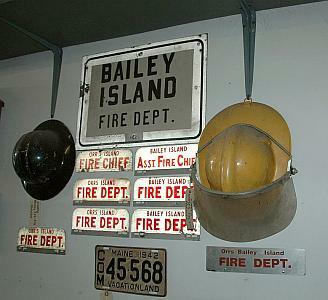 The original Bailey Island fire barn remained in use until it was replaced by a new structure in 2001.